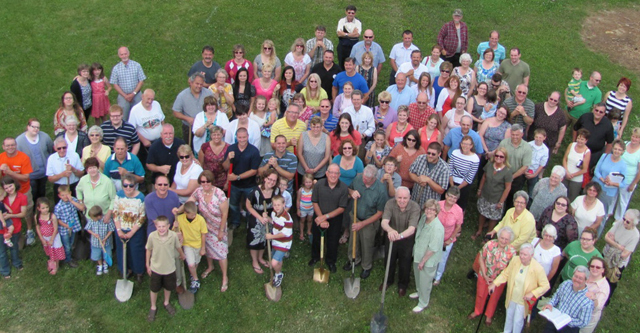 Renovation work begins on Community Grace Brethren Church in Everett, Pa.
Community Grace Brethren Church of Everett, Pa., is launching a long awaited building project this summer. 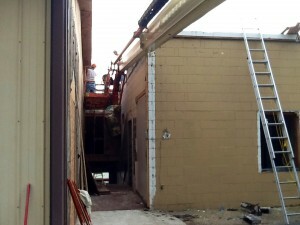 They are building all new offices and nursery with classrooms below while renovating the worship center internally. The goal is that these new spaces will compliment the current worship center and fellowship hall that was built during Pastor Tim’s leadership. The worship center is also receiving a major internal renovation with new carpet, seating, and updated aesthetics. The project is being led by Danny Bennett, a long time Community GBC member who is retired and will be the project manager from start to finish. There is also a building team that has hashed out the project for many months. The many talented and giving people of Community GBC will also be a great help throughout the process. 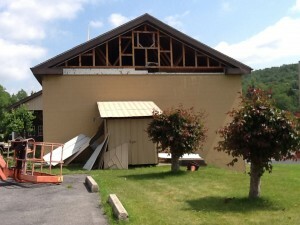 Workers begin to prepare for renovation and building at Community Grace Brethren Church in Everett, Pa. The building project is anticipated to be complete by the year’s end. The church was founded in 1984 and soon called Pastor Tim Boal who served as senior pastor for approximately seven years. Pastor Steve Jarrell served for three years subsequent to Tim and Pastor Jeff Peeler has served as the lead pastor at Community for more than 16 years. Also Lee Seese has ministered as the full time pastor of youth and parents for more than 20 years. Community GBC has regular yearly outreaches to the community as well as short-term trips to assist other Churches, often in the inner cities. A partial list of such activities would include partnering with About My Father’s Business in Washington D.C. to feed the homeless; partnering with Urban Hope in Philadelphia for many construction projects; holding the Annual Trunk or Treat ministry with hundreds of local children and parents; and holding a monthly guitar club in nearby Bedford at The Cellar.